A three-year project will reclaim water space from buildings that have encroached on the Tan Hoa - Lo Gom Canal in the western districts of HCM City. The $146 million project to upgrade the canal, one of the most polluted waterways in the city, will also carry out dredging work and build embankments along its 7.4km length from Tan Phu District to District 6. A 3km long system of culverts running from Tan Phu to District 11 will be installed to collect waste and rainwater in a move aimed at reducing the discharge of wastewater into the canal. On the canal banks, the project will build a total of 12km pedestrian pathways 6m, 13m and 20m width. Ten small bridges will cross the canal in different parts and four parks with a total area of 14,000sq.m will be developed to ease circulation and enhance the view. 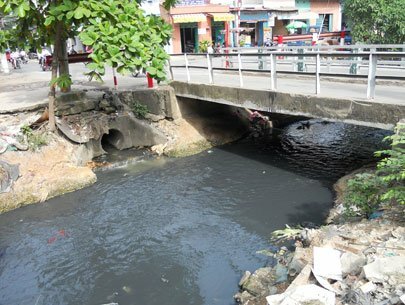 “It is the most polluted canal and one of the main causes for flooding in the western districts of the city,” said Le Thanh Liem, director of the city’s Urban Enhancement Project of Urban Enhancement. Liem said that the project would also construct 0.8km of drainage system and a small pump station that allows the collection of wastewater from inner areas of the districts. After its completion in 2014, the project will benefit about one million residents that have been badly affected by pollution and flooding for a long time. The project is a part of the larger $592 million HCM City Urban Enhancement Project that the World Bank has funded with a $266 million loan. Begun in 2004, the city enhancement project aims to improve infrastructure in areas with low-income residents, upgrade drainage and water supply systems, and improve the livelihood of residents in the city’s western districts. The project has faced many delays over the years, with the main delay caused by site clearance involving 1,643 houses in District 6, District 11 and Tan Phu District, Liem said. As of this year, about 22,802 families are said to have benefited from the enhancement project.